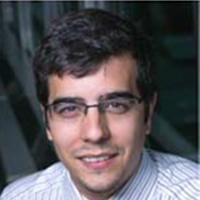 Dr Mickael Pero has been Science Officer at the COST Association since February 2014, where he currently manages a portfolio of COST Actions coordinating research and technology advancement on: urban ecosystems and renewable energy integration in a local context; reliable, safe and sustainable transport modes; advanced monitoring and integration of improved materials for resilient constructions. In 2012, he received a Marie Curie grant within the EU project ManETEI to investigate the emergence of technologies. During his research he was hosted by Fraunhofer (ISI) and could develop close collaborations on the topic both from a private perspective with Bayer as well as from a holistic perspective with the EU project ResAgora. His academic background stands in Economics of Science and Innovation with a PhD obtained at the Bocconi University in 2013. In parallel, he applied his knowledge and know-how to the study of Research Infrastructures by contributing to the EU project RIFI, being at that time hosted by Elettra Sincrotrone Trieste (2006-2011). This experience was complementary to previous knowledge acquired in the socio-economic evaluations of technological SMEs (Brussels and Wallonia, 2004) as well as the technological platform MINATEC (Grenoble, 2005).